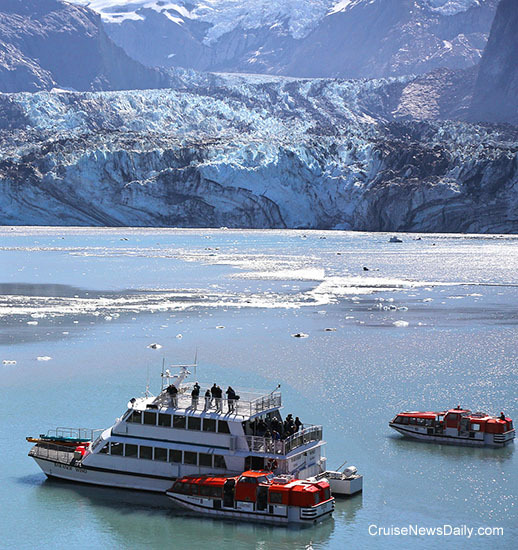 Holland America's Statendam came to the assistance of 103 people aboard a disabled sightseeing vessel in Alaska's Glacier Bay on Friday (August 2, 2013). 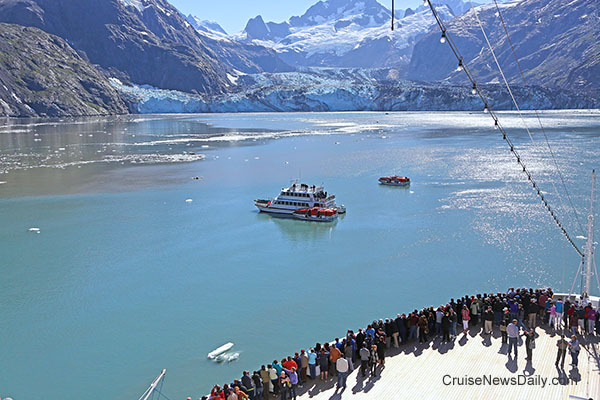 Hundreds of passengers lined the rails of Holland America's Statendam in Glacier Bay on Friday to watch the crew bring aboard passengers from the disabled Barnoff Wind. 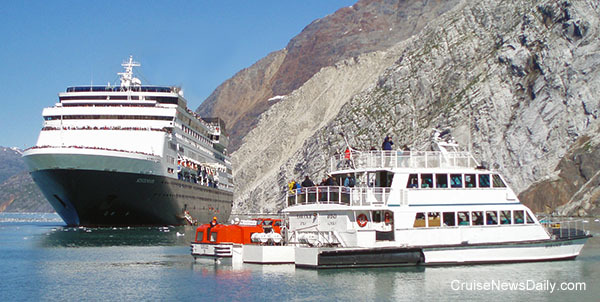 Statendam responded to a call for aid from the 79-foot sightseeing vessel Baranof Wind as the cruise ship was leaving Margerie Glacier about 1:45pm. Baranof Wind was experiencing mechanical troubles and had lost power in the ice near John Hopkins Glacier and asked Statendam to stand by. tourists and one Glacier Bay National Park ranger. Statendam's Captain Jochem Bakker directed the operation from the bridge, while hundreds of Statendam's passengers lined the rails watching the operation. A Glacier Bay National Park ranger aboard Statendam assisted in coordinating the assistance from the ship’s bridge. While Statendam stands by, passengers from Baranof Wind board one of the cruise ship's tenders in Glacier Bay. About 7:30pm, Statendam dropped off its extra passengers at Bartlett Cove, where their sightseeing excursion originated aboard Baranof Wind earlier in the day. Statendam then departed Glacier Bay for Seward where the cruise will end on Sunday. Finalization of a deal between Norwegian Cruise Line and the government of Belize to build a new private resort destination and cruise port in the southern part of the country seems to be imminent. 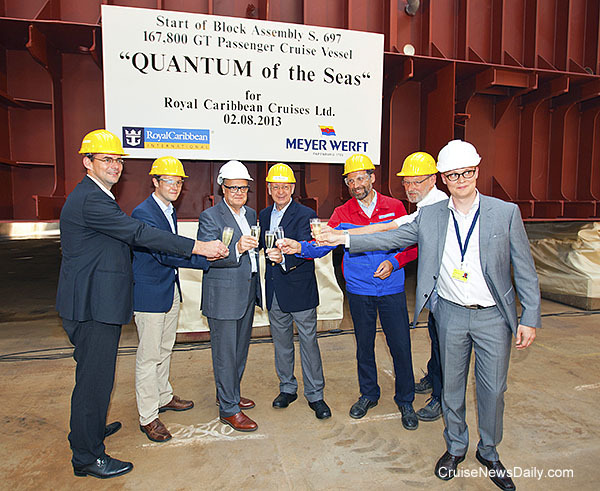 Two of Royal Caribbean’s Quantum-class ships took significant steps in their construction today (August 2, 2013) at Meyer Werft in Germany. 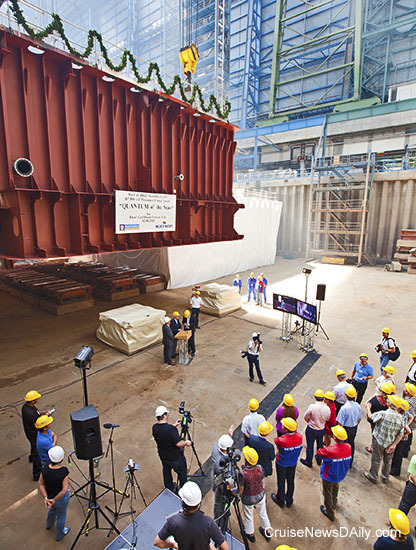 The 430-ton first block of the keel for Quantum of the Seas was lowered into place in the drydock at Meyer Werft today. In keeping with tradition, two coins were placed under the keel. They will remain in place until the ship is nearing completion. At that time they will be retrieved and given to the ship's captain to keep aboard the ship for good luck. Project Manager, Royal Caribbean International and Jan Meyer, Managing Partner, Meyer Werft. Mission accomplished. Executives, in front of the first block, toast the keel laying. 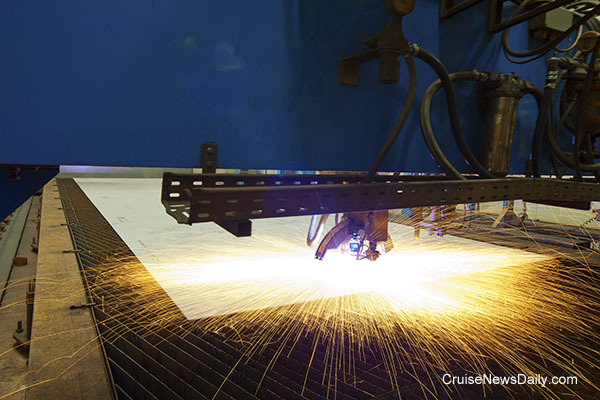 The first steel was also cut today for Anthem of the Seas, the second ship in the Quantum class. Pressing the button. 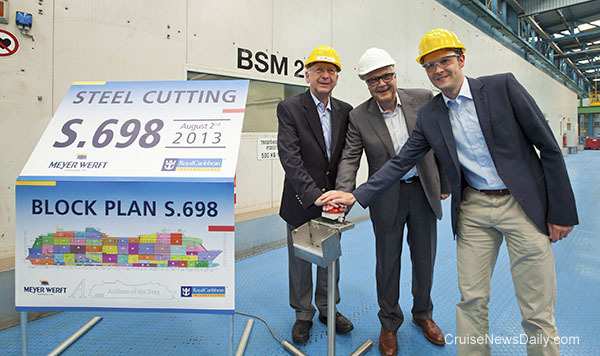 RCCL and Meyer executives press the button which started the computerized cutting of the steel for Anthem of the Seas. Note the block plan to the left. This shows how the giant blocks, like the one placed in the drydock for Quantum, will fit together to form the ship. Details of this story appeared in the August 2, 2013 edition of Cruise News Daily. Today is August 1, and this is the day the major cruise companies promised the senators at the hearings two weeks ago they will have their crime statistics on their websites. As promised, there they are. Interesting, kind of. Useful, not too, but it’s what the senators wanted. They do, however, show cruising to be extremely safe, statistically speaking. Norwegian Cruise Line has become the first cruise line to be certified that they meet the requirements of the International Labor Organization’s Maritime Labor Convention (MLC) 2006 that provides comprehensive rights and protection to crew members. The convention sets out seafarers right to decent working conditions in a wide range of areas. A crew member aboard Star Princess reported being raped by two other crew members on Monday. The incident allegedly happened while the ship was in Alaska’s Chatham Strait en route to Juneau between 4am and 6am. The All-Star break has just passed, and that means the baseball season is half over, but there’s a reason to hope this half flies by as fast as the first half. When it’s over that means MSC’s Baseball Greats cruises begin. And this year, they’re going to be bigger than ever because they will be aboard the giant MSC Divina during its first winter in the Caribbean. CND subscribers also read about getting them to come to Puerto Rico ... legal resolution ... and the Mexican dip. Lin Arison will be the godmother of Carnival Sunshine, officially naming the ship in New Orleans on November 17. Mrs Arison comes to the job with experience and a very notable connection to Carnival Cruise Lines. CND subscribers also read about a bonus day at sea ... an interesting barometer ... where cruise lines can now put the pedal to the metal ... and two more lines cancel Egyptian calls. There were several interesting comments during Norwegian Cruise Line’s earnings call today for financial analysts. Much of the call was technical about earnings and forecasts, but there were a couple of comments we thought would be of interest to our readers. Carnival Dream aced its latest US Public health inspection at Port Canaveral.